Last Friday, I was unloading Coco and my work things from the car when I noticed an older couple in a car looking at my house. The lady rolled down the window and told me she grew up in my house and they had been looking for it. Of course I told them to pull over and come have a look. I knew that at some point in time, my house had been moved to it's current location, but I didn't really know the backstory. I had been told that my house was in the way of the I-205 being built and that's why it had been moved. That, it turns out, was not true. Carol knew everything about the interior of the house and told me all the little features her father had put in. So I knew Carol was legit. When Draga and Nick got engaged, Nick bought a parcel of land approximately 1/2 acre. He paid $400 for the land. They married May, 11, 1941 and the house was build in the next few months. The cost of the house was $3,030 without the garage, which was built later. The address was 8410 S. E. Oak Place., 97266 and the house was in the middle of the block. 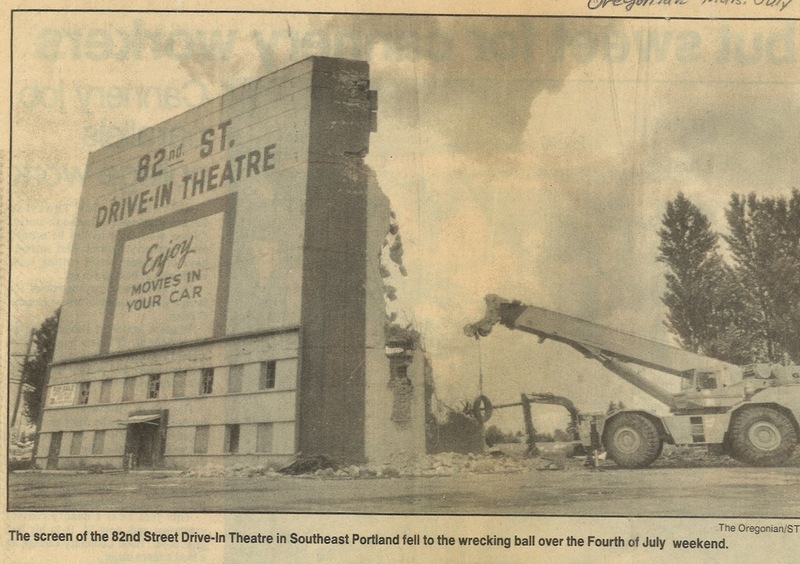 The street was just a couple of blocks south of Johnson Creek Blvd and one block north of the 82nd St. Drive-in Theater on the east side of the 82nd. Nick's parents lived at the beginning of the street on 82nd and owned Deluxe Fuel Company, where he worked. His sister lived at the end of the block facing east where the large oak tree stood, hence Oak Place. 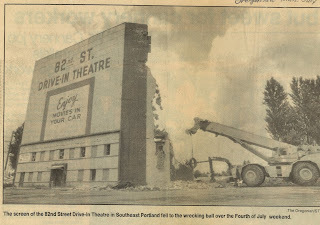 Directly across the street from the house was Battin School and directly behind them was the theater. Nick and Draga raised four children in the house. There were many joyous occasions celebrated there, including large family gatherings and holiday parties, Easter egg hunts, watching the movies in our back yard and from upstairs as the large outdoor screen was positioned perfectly. Nick and Draga always had a large garden, as it was a necessity when raising their family, including berries, vegetables, fruit trees, garlic braids, etc., plus Mom's rose garden and dahlias. It was a ritual to dig the first hill of potatoes in the spring and taste Dad's signature Illini sweet corn. They lived in the house for 45 years, 1941-1986, and finally sold it when the Johnson Creek Crossing was developed. The house was moved to its current location by Emmert International. Terry was a childhood friend and a classmate of my brother. 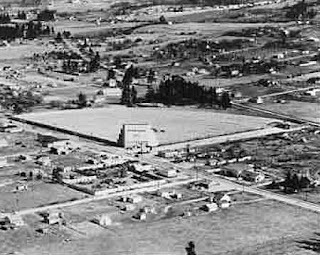 Currently Emmert is building the large Asian market at 82nd and Foster, the former Fred Meyer location. 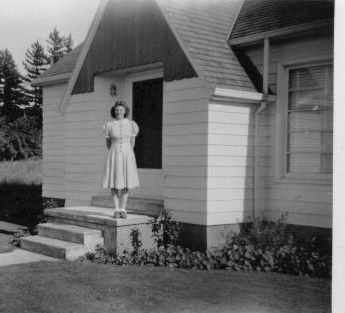 The first image is of my mother on the front porch. As you can see the peak of the house was originally natural wood. It looks like a knotted wood of some kind. The peak was later painted white to match the siding. 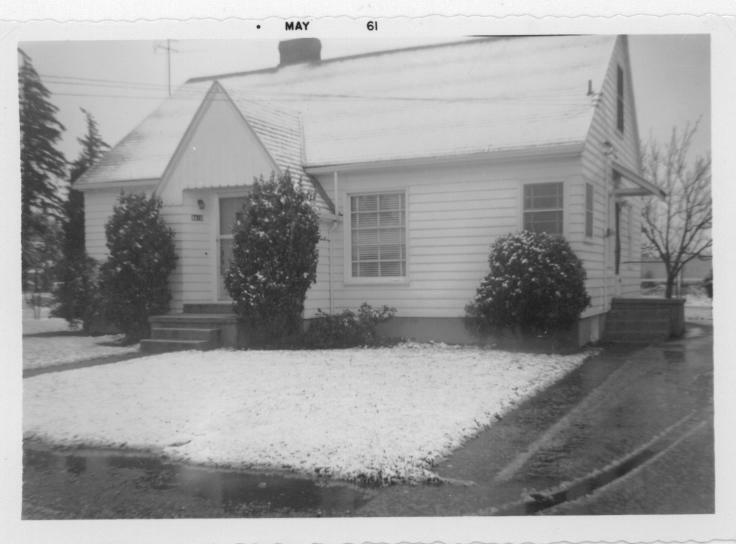 The second image in the snow was taken in early 1960s. 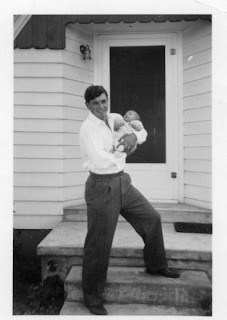 In the third image Dad is holding me. The fourth image shows the arch that separated the living and dining rooms. The dining room window has frilly curtains. The man with the white shirt is sitting close to the front entry closet. Nick and Draga were married 71 years and loved by all who knew them. 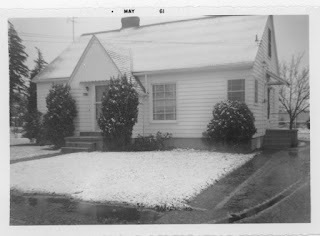 The house was a wonderful home for us kids and much loved. I am so happy that it is in your care and again surrounded by beautiful gardens. I always wanted a little white house with a picket fence, and now I'm glad to know of Draga and Nick and all the good things that happened in this little white house that I now call my own. Even better is knowing they were gardeners. 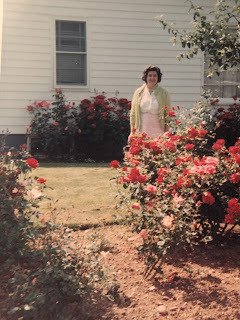 This spring, I'll be looking for Illini sweet Corn for the veggie garden and in Draga's honor, I bought a David Austin 'Queen of Sweden' rose to plant next to the one rose that remains from when I moved in. I hope Draga would approve of the rose! Now to find Nick's sweet corn! A party in the living room - The arch is gone, but its mark on the wall can still be seen. Isn't this wonderful? We had a similar experience (or rather Michael did). He was out weeding one day and a woman pulled up and said she used to live in our house. We didn't get the detail that you did but keep hoping that she will return one day so we can hear more. I will invite them to my open gardens and I did find Nick's sweet corn at Burpee, which I'll be planting when the soil warms up. I hope to present them with some at the end of summer. Well that's just so fabulous! I am thrilled you were there to meet them when they found the house again. I have a long story about the former owners of my house in Spokane and their nieces and nephews. Knowing it made owning that home so special. It's nice knowing there was not a mass murder in your house for sure!